We've got all sorts of penguin printables at Activity Village - great for winter themes, Antarctic studies, and just for fun, as it is hard not to love penguins! A cheeky Christmas penguin adorns this cute Christmas writing paper for kids. Three variations available to suit all ages and projects. There are two very cute penguins decorating this lovely Christmas writing paper! Choose from our three versions below: blank, lined and with handwriting lines. This complete the picture, with a cute picture of a penguin, is perfect for younger children. A fun way to practise pencil control and copying skills! Kids can learn how to draw a penguin by following our step by step illustrations below. It's easy when you know how! Why not add a Christmas hat and scarf to make this little fellow into a Christmas penguin? Learning the alphabet will be fun with these very cute penguin alphabet posters. They will make a great display either at home or in the classroom. We think the kids will love playing with these fun penguin dominoes! Print them onto some card, cut out and laminate for extra durability. They would make a lovely stocking or party bag filler! Here's a cute little jigsaw for penguin fans! Just print, cut out using our templates, and you've got a quick puzzling activity for the kids.You will need our jigsaw instructions and cutting templates. These penguin number posters would make a great display at home or in the classroom. Counting from 1 to 20, they would look great framing a window or whiteboard, or hang them washing line style across the room. This gorgeous penguin would look great on the wall in a classroom or nursery, or use it for crafts, lacing activities etc. Penguins are so funny and adorable that a picture of one will always brighten up any display! Simply print out this poster and use for your displays and topic work. 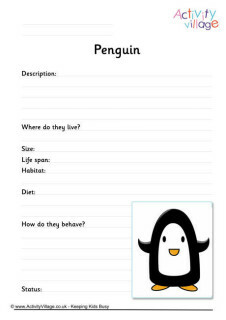 These cute penguin shopping lists print out two to a page. How about cutting a stack and hanging them on the fridge during December? Here's a fun penguin template - which comes in many different sizes. Cut penguins out in paper, card, fabric or craft foam, and use them to decorate your classroom or home! The larger sizes make good writing frames too. This gorgeous Christmas penguin to do list is a fun way to keep track of Christmas chores and tasks, and looks great up on the wall! Do you know someone who loves penguins? Print out and fold this fun card (using your printers borderless settings for best results), and send it to them as a lovely surprise! Penguins always seem to be having lots of fun in the snow and ice! Print this fun poster to display at home or in the classroom. This gorgeous penguins writing paper is sure to encourage a letter or story or two! Three versions available - blank, lined and with handwriting lines.